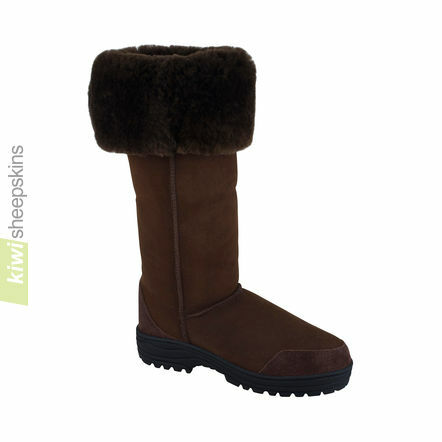 Extra tall boots featuring an additional section of sheepskin at the top for added height. When partially or fully folded down the gorgeous woolly fleece side of the doubleface sheepskin is revealed. or see Footwear Sizing tab below. Very popular, musketeer-style extra tall boots with an extra section of sheepskin at the top for added height that can by partially or fully folded down to show the woolly fleece of the sheepskin. NOTE: Due to the large size of these boots, the extension piece at the top of the boot may not be from the same piece of sheepskin as the rest so there may be some color difference. This will only sometimes be detectable if the tops are worn up at full height, and not if folded down with the wool side showing as supplied. 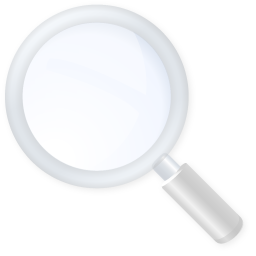 NOTE: The outer side of black color sheepskin may be a charcoal grey and not true black. Also note that for darker colors of sheepskin footwear, especially black, dye transfer may occur during the first few wears. The color of the insoles for Black and Chocolate color boots may sometimes be white/cream. See Footwear Sizing tab for sizing info. All our footwear is available in a single regular width fitting, however the soft nature of the sheepskin's wool and leather allow it to accommodate various foot widths to some extent. Maximum calf circumference is at the top of the boot. Generally the Ultimate boots run about true to size, especially for women. For men, if between sizes or if you have fairly wide feet, you can normally go up a size. 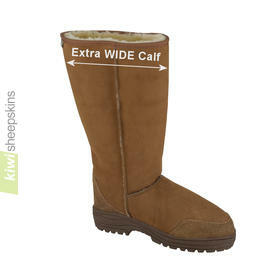 Feedback from delighted customers who have purchased these extra tall sheepskin boots. Happy in my Musketeers! The Musketeer boots are the best sheepskin boots I have ever purchased - and I have owned quite a few over the years. By far they outrank any Aussie Ugg boot I have previously owned. I recently purchased a pair of Ugg boots from your website and I want to congratulate and thank you. My boots are awesome, I love them. Also your team is fantastic, I made a mistake on my shipping address, which I didn't realise until I received a shipping confirmation. I emailed you guys in a panic and thankfully you were able to pull my order before it shipped and re address them for me. The order was to ship to the US and I got them within one week. So many companies in Australia are following suit of the US brand UGG Australia and charging outrageous prices for ugg boots. I was happy to find your website and I was thrilled with your service and happy with the price and of course my awesome boots. They look like they are great quality and they are extremely comfortable. I've told all my friends, I hope they buy from you in the future. I hope that you continue to have much success. Fabulous boots arrived today 5 Nov, thank you so much & for your prompt service. The first boots ever to be long enough for me. I just received my boots...OMG....I love them so much....best quality boot I've ever owned. Now I want them in black! Thank you all very much for the 2 pairs of boots! One was for myself and after my mum tried them on she wanted one too! We are very impressed with the quality. The foam insole is especially comfortable. I tried on all the UGGs in our local store and they were all SO uncomfortable. Also the fact that the fur is all around in the inside of the boot makes it extra cosy but however warm I get my feet don't sweat at all unlike cheap lookalikes. We are also very impressed with the speed of delivery. Thank you again. Hello, I just wanted to say I have received my Musketeer boots today and I am in LOVE!!! You came highly recommended by a friend who also bought the Musketeer's, and a year on they are still as good as the day they arrived. Really impressed with your service and speed of delivery, 4 days from NZ to UK....Fabulous service, thank you! I received my boots and was very pleased with the workmanship, and fit. Very comfortable, and warm. The light weight is a welcome surprise, most other boots would be too heavy to be comfortable for long periods. Can't wait for some fall camping! Received my Musketeer and Mid Calf boots today. I live in an old house with drafts and my calf were always cold. As I sit here and type this I have on the Musketeer tops all the way up and my legs are loving them. I am sure that I will be enjoying both pairs. And fast shipping too. Thank you so much. I've received the boots today. They are absolutely gorgeous. They fit like a glove. There is absolutely no comparison to the EMU boots. I'm so in love with them that I've decided to order the same boots in the other two colours. Thank you very much. Hi and many thanks for the fantastically rapid delivery of my wife's Valentine's gift. The boots arrived first thing this morning, exactly a week after placing the order. We are both very impressed by the boots quality and the service you provide. The boots are of a far better design and quality than the Ugg boots everyone's wearing. My wife hasn't taken them off since they arrived! We would highly recommend your footwear and I have no doubt my wife's friends will want to know where she got her boots from!! Again, many thanks. Just wanted to let you know that I received my boots this afternoon and they are awesome!! I own UGGS and Australia Luxe boots and these definitely are my new favorites!! Thank you very much!! I will be ordering more soon and will tell all my friends where I got these awesome boots!! God bless the internet and have a great day!! I just want to say my boots came today and what can I say I LOVE LOVE LOVE THEM. My mum originally bought a pair from you about five years ago and tells everyone about you and they are a great deal better than certain brands. Thanks a million. I just want to thank you for everything. 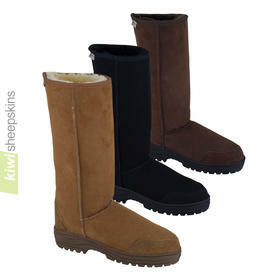 The quality of your product (Musketeer Ultimate Sheepskin Boots) is Excellent. Sizing exactly as described. I placed my order 8 days ago and got it today all the way in Calgary, Alberta, Canada. Excellent is all I can say. You have repeat customer in me! Thank you so so much for my Musketeers Boots which arrived in record time. The quality is second to none and the fit perfect, start off snug and mould to your feet for comfort. I will be climbing into them around late November and emerging some time in Spring :) I'm so thrilled with my purchases and will be buying many more products from you. Just wanted to say, we received your extra tall musketeer boots in black today, 2 days before Xmas, after only ordering them last week. They are truly gorgeous!! And the service and shipping so fast. I love them. 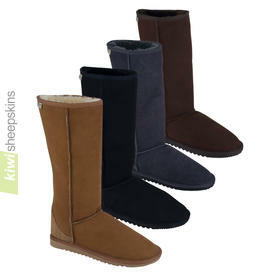 The quality is unbelievable, and definitely so much better in every way, than Uggs. So nice that they are actually made right there in New Zealand. I am telling all of my friends about you!! Thank you so so much for a beautiful product. I received my order today, much earlier than anticipated. I LOVE the boots & they are a perfect fit. We are supposed to get snow this week so they couldn't come at a better time. I have passed on your website details to some of my friends, so hopefully you will receive a few more orders from Ireland. I have just ordered an Ultimate Side laced up boot as well as Musketeer Ultimate sheepskin boot, of course simply because I couldn't choose between the two! When they are at such a reasonable price, why not! Just wanted to let you know, my husband arrived back from NZ with a pair of chocolate Musketeers. They are awesome and fit perfectly! Much nicer than those 'Australian things!'. I will definately be ordering more, for sure! 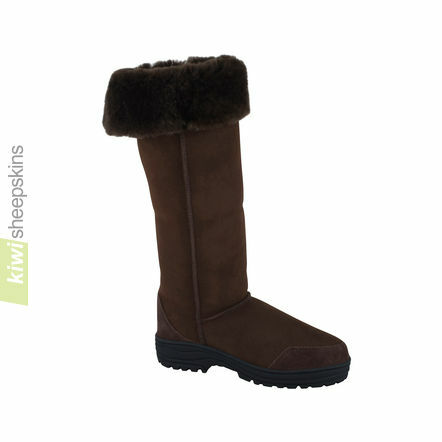 I've converted my friend from Uggs to these as well (so hopefully orders from her too), so you'll have two more promoters of Kiwi Sheepskins on this side of the pond!! Your customer service is fantastic, and the sizing guidelines are excellent. Received boots yesterday. THANK YOU! They are wonderful! I feel like I am wearing slippers...so nice. Better than description. Thank you very much for such nice pairs of shoes!!! I ordered two pairs, Ultimate mid calf and Musketeer boots. They are superb!!! Everyone says they are really cute. Not to mention they are very comfortable and warm. Thank you very much once again, it was really a pleasure to do business with you. 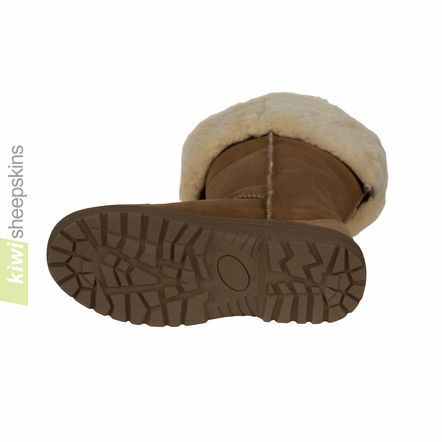 See more testimonials for our Sheepskin Boots range.